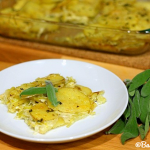 What is more simple and pleasing than potatoes? 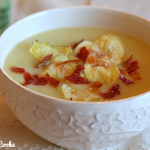 The ultimate comfort food in my book, they are so incredibly versatile – you can do just about anything with them. Next to sushi, the potato is my favorite food. It makes me feel all warm and cozy inside. In my next life I want to be a potato because everybody would love me and I would be such a great multi-tasker! There are so many interesting and intricate things you can do with potatoes but I want to put that aside for one day and go back to basics. What is more basic than potato wedges? 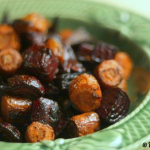 So simple and effortless yet irresistible, they make a perfect side dish. In fact, they are so good I could make them my entire meal! 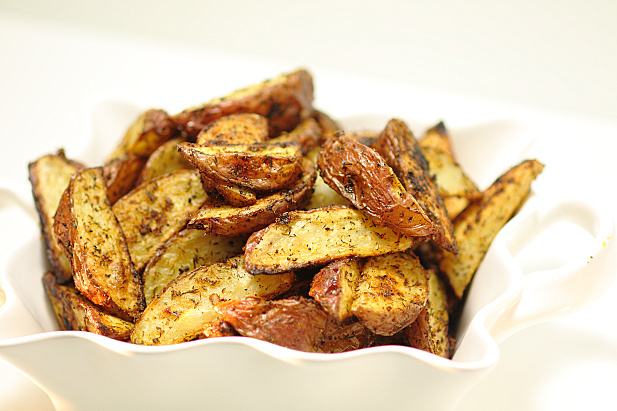 There are two key tricks to baking wedges that are crispy on the outside and soft and moist on the inside: 1. Soaking in water, and 2. Parchment paper. By soaking your raw cut wedges in water for at least 30 minutes, you remove some of the moisture. I know that sounds weird – soak in water to take OUT moisture? Barbara – you crazy! The reason it works is because the water will help draw out some of the starch in the potato. Starch holds in moisture, so by drawing out some of the starch, the potatoes will become crispier as they dry out during cooking. Parchment paper is one of my favorite must-haves in the kitchen. It promotes even cooking, keeps the sides of food that touches the roasting pan/sheet from burning and draws out extra moisture so the wedges can reach their ultimate crispiness! 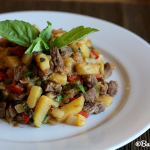 Enough gabbing – get cooking! 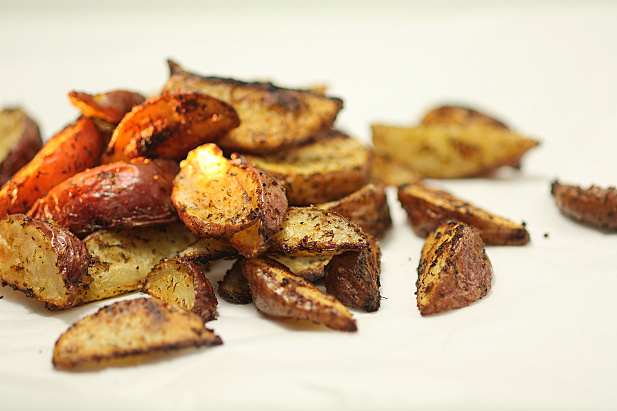 Cut each potato into 6-8 wedges depending on the size of the potato. 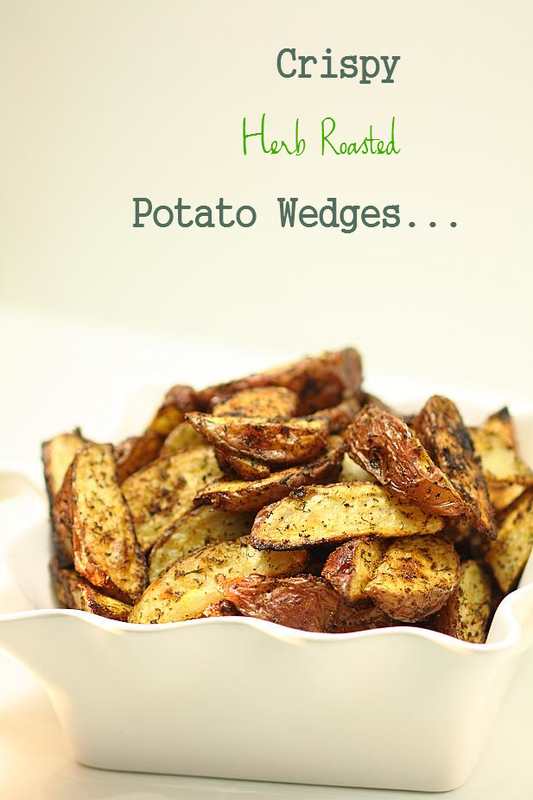 Put the wedges in a bowl and cover with cool water. Let sit for at least 30 minutes up to an hour. Drain and rinse well. Pat dry with paper towels. Combine the dill, garlic, paprika, salt and pepper in a small bowl. Toss the potatoes with the olive oil and then the seasoning mix. 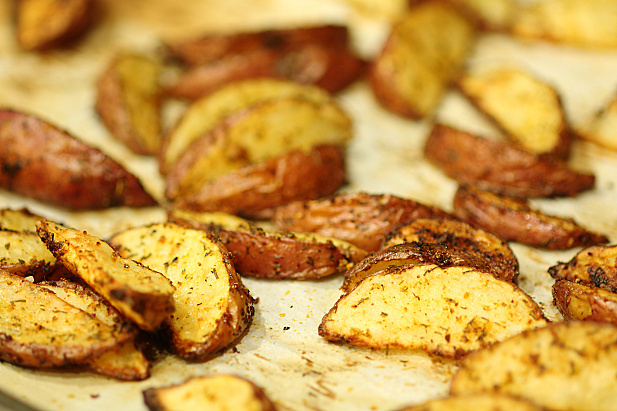 Line a baking sheet with parchment paper and spread the potatoes in one layer on top. Bake 30 minutes or until edges are a golden brown, tossing one to two times during cooking. 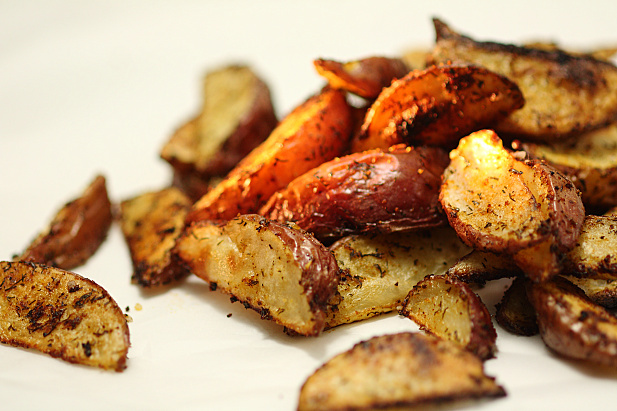 I absolutely LOVE crispy herb potatoes! So addicting, I swear every time I make them I eat the entire batch within two days. Thanks, Katelyn! That’s so special to hear!